We read The Cat's Table (Vintage International) for my book club a few months ago. It was my pick. It's weird because I hate the jungle and my first pick for book club was set in the jungle and I don't really like reading about the ocean and I've already picked 2 books for us to read about the ocean. This is one of them. I am in love with Michael Ondaatje's poetry in The Cinnamon Peeler: Selected Poems so I was interested in reading one of his novels. This one is fictional, but semi-autobiographical. 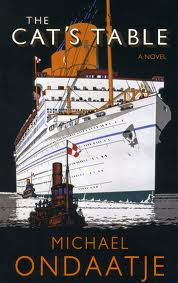 It takes place in the 1950s and follows a young boy's trip across the Indian Ocean from Colombo to England. He's seated at the "cat's table," which is the furthest from the Captain's table and is made up of poor nobodys. Interesting, right? That's why I picked it. But to be honest, I found the writing just a tiny bit pretentious and I didn't love it, even though the story is quite good. So there you have it! As for The English Patient (Everyman's Library (Cloth)) , never heard of it. KACY. You have to read The English Patient and also In the Skin of a Lion. The later novels are not all that, but TEP and ItSoaL ARE all that. SRSLY. I feel very strongly about this message. Lisa B, I am persuaded by this comment. It's your use of caps. caps are the ultimate in rhetorical effectiveness. it's what I teach my students: all caps, all the time = win! My husband gave The Cat's Table to me for Christmas a few years ago. I ultimately liked it, but found the plot very slow-moving for about 3/4 of the book, and then everything seemed to come to a head and wrap up in a few pages. And (thanks to the BYU Humanities department) I don't find ANYTHING slow. Glad to know I'm not alone in reading this book and thinking "hmm." It was tha first book my son has read. Now it's in his list of the best ones.